4029 2008 Laser Hot Hits. Dance mx, email from Germany. SINPO 44444. 6220 1927 Radio Sluwe Vos. Boney M "Ma Baker," ID. SINPO 44433. 6240 1938 Bad Boys Radio. Jingle ID, pop. SINPO 44433. 6449 1944 Studio 52. Dutch songs, ID. SINPO 4433. 6553 1948 Radio Pink Panther. ZZ Top "Legs." SINPO 44433. 4029 2216 Laser Hot Hits. "I Need Your Love." SINPO 34333. 6280 2210 Radio Karbiet. Dutch song then Madness "Night Boat to Cairo", ID. SINPO 44433. 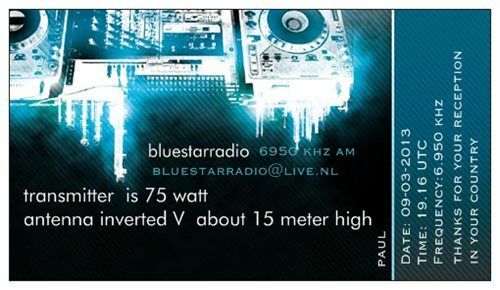 6305 1725 Radio Telstar. Dutch songs. SINPO 44433. 6306 1736. Radio Malibu. On after Telstar c/d, "Bye Bye Love" Everley Brothers. SINPO 34333. 4029 1750 Laser Hot Hits. Kinks "Waterloo Sunset." SINPO 34333. 6045 0920 XVRB v Germany. Frankie Laine song, ID. SINPO 55444. 6200 0740 Radio Orang Utan. Tina Turner "Simply the Best," ID. SINPO 24332. 6200 1113 Radio Technische Man. Goombay Dance Band "Seven Seas." SINPO 34333. 6216 0750 Radio King SW. Rock, dodgy mod. SINPO 34333. 6241 0755 Radio Bonofox. IDs, "I Had the Time of My Life." SINPO 34333. 6244 2215 Radio Underground. ID, North Korean pop! SINPO 44433. 6262 1020 Cosmic Radio. Johnny Cash "I Walked the Line." SINPO 24332. 6266 2151 Radio Mi Amigo. Middle of the Road song, ID. SINPO 34333. 6285 0745 Radio Focus Int. Halcyon Days songs. SINPO 44433. 6295 1040 Radio Telstar. Dutch song, ID. SINPO 24332. 6304 2208 Odynn Radio. Jingles, Animals "House of the Rising Sun." SINPO 44444. 6305 0800 Radio Merlin Int. Meat Loaf "Real Dead Ringer for Love." SINPO 44444. 6325 1155 Black Bandit Radio. Scorpions, ID, greeting Klaus. SINPO 34333. 6325 1712 Radio Norton. Dutch music. SINPO 24332. 6421 1744 Radio Zeewolf. QSO with SWCH. SINPO 34333. 6422 1218 SWCH. Polka, promo for summer meeting 2013. SINPO 24332. 6432 1707 Radio Zwarte Panter. Dutch songs, ID. SINPO 34333. 6508 1735 Radio Onda Caliente. Music just audible, short test. SINPO 24332. 6535 1205 XXL Shortwave. Jingle IDs, Dutch music. SINPO 24332. 6540 2156 Radio Powerliner. Closing down, greeting Terry, polka. SINPO 54444. 6553 1015 Radio Pink Panther. Oldies. SINPO 24332. 6735l 2233 Radio Ronin (USA) via Hot Radio. Rock music. SINPO 34333. 6745 1724 Radio Pioneer. UB40 "Food for Thought." SINPO 34333. 6935 1210 IMR. ELO "Hold on Tight," T Rex "Get it On." SINPO 34333. 6990l 2210 Baltic Sea Radio. "Johnny Be Good", jingle ID. SINPO 44433. 3905 2220 Radio Sallandse Boer. ID in Dt, BZN. SINPO 34333. 4029 0804 Laser Hot Hits. Kym Mazelle song. SINPO 24332. 6210 1525 Radio Sluwe Vos. Stan Ridgway "Camouflage." SINPO 24332. 6210 2300 Radio Flying Dutchman. Deep Purple "Black Night," burst of strong ute. SINPO 54444. 6245 1840 Radio Black Bandit. Country mx, ID, greeting Andy. SINPO 54444. 6285 1424 Radio Focus Int. "Something's Gone Wrong Again," song. SINPO 34333. 6290 1843 Radio Waldmeister. Kate Bush "Running Up the Hill," splash from Focus. SINPO 33333. 6300 1906 Radio Norton (tent). "Green Onions." SINPO 24332. 6300 2211 TRX Radio. ID jingles, blues mx. SINPO 54444. 6305 2208 Radio Powerliner. Steve Allen "Letters from my Heart", splash TRX. SINPO 43433. 6325 1549 Radio Merlin Int. Pogues "Pair of Brown Eyes." SINPO 44433. 6325 2204 Radio Ascona. "Knocking on Heaven's Door." SINPO 34333. 6326 1849 Radio Caroline Int. Jingles, pop. SINPO 34333. 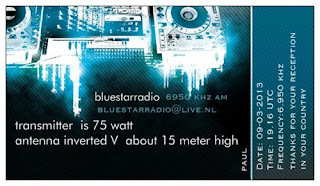 6425 2158 Radio Universe. "Funky Town", ID/email, co-chan utility. SINPO 43433. 6553 1530 Radio Pink Panther. Oldies. SINPO 34333. 6920 1510 Trans Europe Radio. Instr mx. SINPO 34333. 6932 1518 IMR. Northern Soul show. "I'm in with the In-Crowd." SINPO 34333. 6935 2250 IMR. Slight freq change. Blondie "Denis," ID. SINPO 44333. 6990l 1914 Baltic Sea Radio. Arabic sounding music, seagull ID. SINPO 44433. 15880u 1318 Radio Spaceshuttle Int. "Macarena." SINPO 24432. 3905 2054 Radio Underground. Paul Hardcastle "19". SINPO 34333. 4029 2214 Laser Hot Hits. Gerry & the Pacemakers "I'll Be There," Tony James. SINPO 44433. 6245 2047 CWR. Black Box "Right on Time", Andy Walker. SINPO 34333. 6295 2035 Radio Odynn. Cliff Richard "The Young Ones," jingle IDs. SINPO 34333. 6305 2040 Radio Merlin Int. Weak signal, ID through pirate chat. SINPO 24332. 6540 2222 Radio Powerliner. Reggae, ID, closing down. SINPO 34333. 6553 2044 Radio Pink Panther. ID, oldies. SINPO 24332. 3905 1940 Radio Activity. "I Fought the Law", ID. SINPO 44433. 4029 1921 Laser Hot Hits. FSN News ad, r&b song. SINPO 44433. 4029 2023 Laser Hot Hits. Old recordings of Laser. SINPO 44433. 6291 2009 Radio Caroline Int. ID jingles, pop/dance. SINPO 34333. 6425 2028 Radio Tidalwave. Kim Wilde "You Came", ID. SINPO 34333. 4029 2014 Laser Hot Hits. Recordings of 60s offshore station Atlantis, SSB QRM. SINPO 43433. 4890 1956 Radio U Boat 66. Style Council. SINPO 34333. 6305 1945 Radio Merlin Int. "Last Night A DJ Saved My Life," running 150W. SINPO 54444. 6436 1933 Radio Zwarte Panter. Dutch songs, ID, bad modulation. SINPO 44333. 15810 1950 Artems World of Radio v Spaceshuttle. Latin Am mx. SINPO 24332. 6245 1827 Sluwe Vos Radio. Oldies, ID jingles, occasional bursts of ute QRM. SINPO 44433. 6326 1817 Radio Caroline Int. Pop/dance, ID jingles. SINPO 44433. 6427 1822 Radio Zwarte Panter. Instr mx, IDs "Black Panther". SINPO 43433. 3905 1910 Skyline International Radio. Kim Wilde "Cambodia "Funky Town." SINPO 54444. 4029 1931 Laser Hot Hits. Talk about Dallas (the TV show), JR song. SINPO 44433. 6250 1923 Radio Tina. ID, instr mx, ute QRM. SINPO 43333. 6285u 1915 Radio Sierra Mike. "Macarena." SINPO 24432. 6305 1949 Radio Powerliner. M "Pop Music", ID, greetings. SINPO 54444. 6326 Radio Onda Caliente. Dance mx, ID jingle. SINPO 44433. 6422 1905 SWCH. "Fly Robin Fly," summer meeting promo. SINPO 54444. 6450 1920 Radio Tidalwave. "Crocketts Theme." SINPO 54444. 6553 1900 Radio Pink Panther. "Simple Minds "Don't You Forget About Me." SINPO 44433. 6937 1856 IMR. ID/email jingle, ELO "Hold on Tight". SINPO 34333. 3932 2202 Bogusman. Men They Couldn't Hang song, talk Cable Street. SINPO 54444. 4029 0802 Laser Hot Hits. Current pop. SINPO 24332. 6205 0755 Radio Goudenster. Dutch instr mx. SINPO 34333. 6210 1717 Radio Marabu. IDs, talk in Gm, alternative mx. SINPO 34333. 6250 1634 Radio Flying Dutchman. Dutch song, some ute QRM. SINPO 33333. 6285 1707 Radio Waldmeister. S/on, instr mx, IDs. SINPO 34333. 6285u 2158 Radio Sierra Mike. "Axel F", splash from 6290. SINPO 23433. 6287 1645 Radio Pandora. ID jingle, other radio station jingles. SINPO 34333. 6290 2151 Radio Powerliner. "Girl Talk," occasional SSB QRM. SINPO 54444. 6295 1653 Radio Bonte Specht. QSO, Dt talk. SINPO 34333. 6295 1656 Radio Powerliner. QSO, Dt talk, brass band mx. SINPO 44433. 6300 2148 Radio Odynn. Rolling Stones "Paint it Black." SINPO 44433. 6305 1629 Radio Osaka. ID, Dutch song. SINPO 34333. 6325 1622 Radio Malibu. Dutch songs. SINPO 24332. 6430 1726 Radio Zwarte Panter. ID, email, Dutch songs, ute QRM. SINPO 43433. 6553 0814 Radio Pink Panther. Dusty Springfield song. SINPO 34333. 6745 1639 Radio Pioneer. Dutch song, polka. SINPO 34333. 6920 1722 Trans Europe Radio. Euro-dance, " I want to be a Hippy." SINPO 54444. 6932 1613 IMR. Fleetwood Mac "Don't Stop." SINPO 34333. 6937 2145 IMR. Move from 6932. Dance mx. SINPO 54444. 9510 0819 Radio City v IRRS. "Three Steps to Heaven," ID jingle. SINPO 54444. 3465u 2025 Radio Caroline. Unknown relay. SINPO 24332. 4029 1956 Laser Hot Hits. "I Can't Let Maggie Go," talk about Margaret Thatcher. SINPO 44444. 6240 1931 Sluwe Vos Radio. IDs, email add, 60s mx, new tx, ute QRM. SINPO 43433. 6290 1928 Odynn Radio. "Blinded By the Light," SINPO 44433. 6305 1919 Radio Osaka. Rock n roll. SINPO 54444. 6325 1946 Radio Zodiac. Adele song. SINPO 54444. 6735 1937 Echo One via Hot Radio. Honky tonk piano mx. SINPO 24332. The BBC description says: "Man Lab sets sail and goes live with its very own pirate radio station." Thanks to Mike Barraclough for spotting this item. 4029 1910 Laser Hot Hits. Carrie Underwood, Four Seasons, reading rpts. SINPO 44444. 6295 1847 Radio Powerliner. ID, greetings, oldies. SINPO 44433. 6305 1841 Radio Python. ID, alternative music. SINPO 44433. 6320 1853 Radio Mustang. ID, electro instr mx, strong ute, best in USB. SINPO 43433. 6431 1921 Radio Zwarte Panter. Dutch songs. SINPO 34333. 4029 1937 Laser Hot Hits. Roxy Music "Same Old Scene," Paul Stuart. SINPO 54444. 4890 1950 U-Boat 66 Radio. Easy listening music. SINPO 34333. 6240 1929 Radio Caroline/Rainbow. Pirates For Peace jingle, pop, ute QRM. SINPO 43433. 6295 2004 Radio Python. Move from 6300. SINPO 44433. 6300 2000 Radio Python. Alternative music, SSB QRM. SINPO 43433. 6300 1913 Radio Mustang. Madonna "Who's That Girl," ID 1925. SINPO 54444. 4029 0946 Laser Hot Hits. Simple Minds song. SINPO 24332. 6220 1819 Radio Caroline/Rainbow. Jingles, pop/dance. SINPO 34333. 6275 1658 Unid. Enya, country mx. SINPO 54444. 6280 0920 Cosmic Radio. PJ Harvey song, ID. SINPO 34333. 6285 0930 Radio Shadowman. "You're My Heart", ID, off 0932. SINPO 44433. 6285 1649 Bogusman. Talk about snow, alternative mx. SINPO 54444. 6300 0938 Telstar Radio. "Come on Everybody," ID. SINPO 34333. 6305 1349 Unid. Non-stop dance music, Malaisy? SINPO 34333. 6325 1645 Radio Norton. Music. SINPO 24332. 6425 0956 Radio Dutchwing. NL instr, off 1001. SINPO 24332. 6553 1342 Radio Pink Panther. Bananarama song. SINPO 34333. 6932 1454 Irish Music Radio. Motown, regular IDs. SINPO 34333. 15880u 0935 Radio Spaceshuttle. ID/email jingle, pop. SINPO 24433.